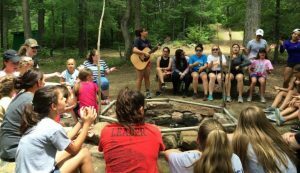 Over the next few months, Conquest and Challenge youth ministries will be running camps across the country, based on methodology used by Regnum Christi’s international youth association, ECYD. This year, Conquest will run 34 camps for boys and young men; while Challenge has 15 camps for girls and young women. A few of the adult leaders gave us insight into these camps. Now, a few years after he first experienced Conquest Camp Kapaun, Kevin has become one of the organizers. He’s from the Kansas City area and the camp is at Chihowa Camp in Perry, Kansas. This year they are bringing back a Eucharistic Procession, which they had not done in the past few years. Kevin commented, “Amazingly to me, the boys really missed [the Eucharistic Procession], and we’re happy to bring that back to them.” They are also planning 12-hour Eucharistic adoration that will go into the night. On the fun side, Kevin said boys there were excited about the pool and the engineering games in which they build things. The boys are also excited that they will have unlimited food, such as hamburgers and fries. Kevin noted that camp has helped his son’s confidence: now his son and friends pray grace in the lunchroom at a public school in such a way that some of the staff have asked the boys to pray for them. He was also impressed by the transformation of the young men who come back as counselors. Fr. John is organizing an ECYD camp in Georgia for kids from the Atlanta area. 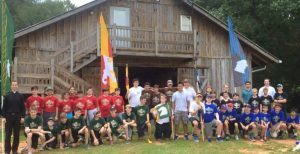 He has two sessions, based on age: the younger boys have “Camp On Fire” while the older boys have “Camp Kingdom.” Each camp will learn about different saints and examine how they had hearts like Jesus’ and built the kingdom of God. We also spoke with two consecrated women about the camps they are planning. Like Fr. John, Natalia is also running summer camps for those from Atlanta, but she’s doing so at the Diakonia center a short drive away in South Carolina. Echoing Kevin Schuster, she noted, “The girls always love the adoration we have one day, because it’s a Eucharistic procession in which we go around the entire summer camp site. The girls are able to make a little altar for Jesus.” When girls are asked afterward when they first experienced Jesus, Natalia noted many girls refer to the Eucharistic procession. The girls are also excited about “Messy Olympics,” with paint, mud, and whipped cream flying all over. The older teenagers who want to help plan the camp impress Natalia. One of the young women told her that camp was the best because she has so much fun and feels so free to be herself. Ally Wheeler, who is organizing a camp at Potter’s Ranch near Cincinnati, also mentioned a Eucharistic procession as a powerful moment for the girls. Ally expressed her own joy at working with the team leaders during training days before the main camp. She was impressed to see that, once they understand the mission, leaders take it on as their own and run with it. By the end of camp, the leaders may be tired, but they know why they’re there. At the end of camp, Ally notices that the 11- and 12-year-olds really admire all that their team leaders do for them. Camps like these will be held this summer across the country. If you want to see if there is a camp in your city, or near your friends or relatives, check out the list of all the camps here: Conquest boys’ camps and Challenge girls’ camps.